As the transnational character of banking and finance activities becomes ever more pronounced, there is a clear need for lawyers in the field to become conversant with pertinent legal developments in national jurisdictions other than their own. This book takes a major step towards fulfilling that need. It not only provides essential orientation in the banking law of nine countries in which international financial business is commonly transacted, but also offers experienced, high-quality insights into developments and trends in each of these jurisdictions. With origins in the discussions of the Banking and Finance Commission of the International Association of Young Lawyers (AIJA), this important work examines the main areas of banking and finance law across a broad spectrum of areas of law from project finance to financial services regulation. 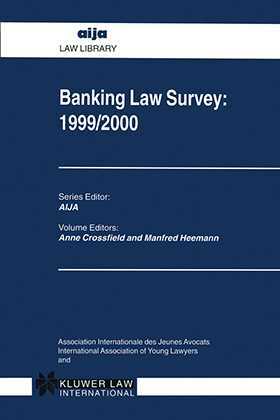 Most of the chapters were originally presented as papers at a conference on "Managing Banking Risks and Combating Fraud" which was jointly organised by IBC and AIJA in London in March 1998. These papers have been updated for inclusion in this work, with the addition of a General Report and a new paper on the United States which takes into account the new Financial Services and Modernization Act (FSMA). Each chapter follows a predetermined outline, so the reader can easily make a comparative analysis across the countries covered.